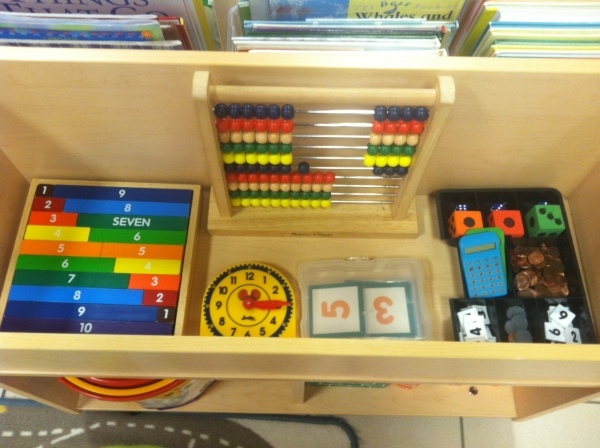 I recently created another space in my classroom that is dedicated to math materials. I rearranged the classroom, mainly to make room for an expanded science center (more on that soon). Where the science area had formerly been, I had an opportunity for something new. I often have mixed feelings regarding whether to rearrange my classroom. 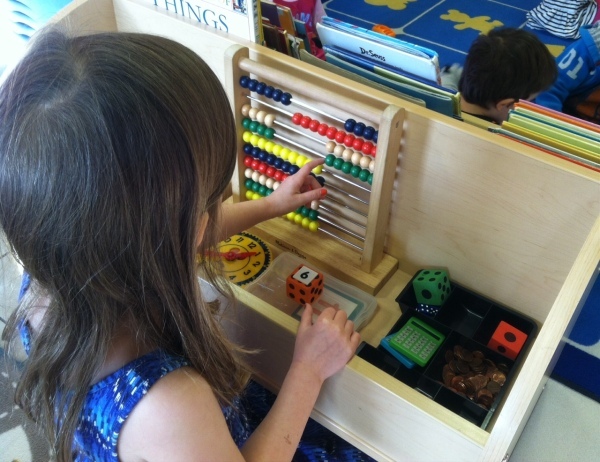 It can be hard to anticipate how children will interact with new spaces. I worry that the things I choose to replace in fact are valuable, and it’s unlikely I’ll ever know the truth. However, the reorganization process is valuable. 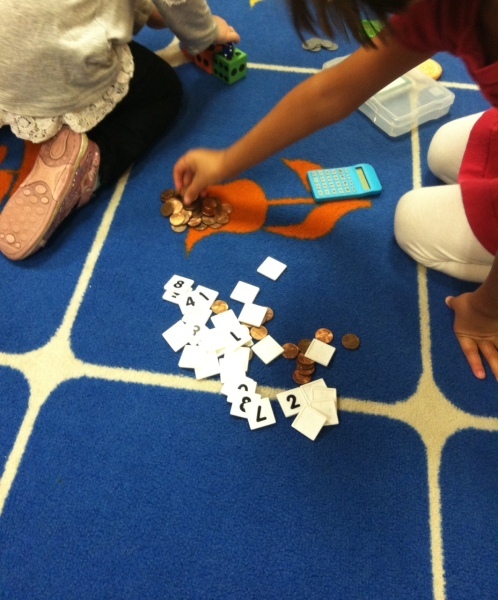 It forces me to thoroughly consider how the classroom is being used and how to make more out of the space we have. As compared to teachers in older-age classrooms, preschool and kindergarten teachers spend a lot of time making major and minor adjustments to classroom design. I postulate that many teachers in higher grades stand to benefit from a bit of preschool mentality in that respect. At any rate, my goal with the newly emptied space was to encourage students to use more early math skills during their dramatic play. The space is located near the toy kitchen, the dolls, the large animals, and the dresser. Consequently, students had previously been using the science tools (e.g., magnifying glasses, items from nature, measuring tapes, etc.) in their imaginative play scenarios. I reasoned that math materials put in that same space might similarly be incorporated. 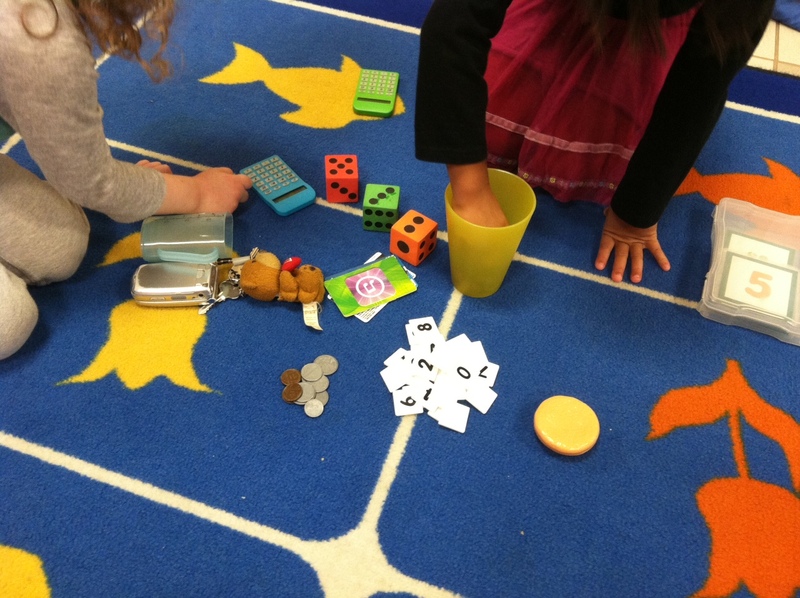 I gathered various items — number tiles, various dice, a clock, calculators, a large abacus, pennies, a number puzzle — and placed them in what I hoped would be an attractive arrangement. So far, it seems to be a success. As I had hoped, children are regularly using most of the items I put out. 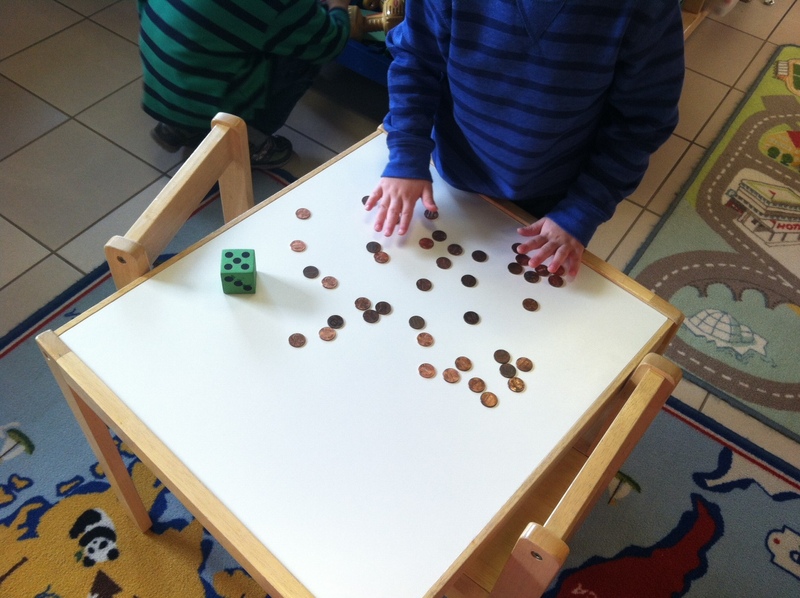 Sometimes they’re used as random accessories (e.g., calculators being used as telephones), but I have observed children counting pennies, rolling dice, matching number tiles, and employing other functional math skills while engaged imaginative play. As the novelty fades, I expect those behaviors will be somewhat less frequent, but I think this new math area will remain a good method of enhancing my students’ early math skills. I like your math area! It looks cheerful & fun. I have a mixed age group and I need a little of this for my older boys. Thanks for sharing your space. Thank you! Good luck and let me know if you have any questions or need any help.